the company that invented portable electrolyte hydrationwill offer cyclists a new, caffeinated option of its unique quick-dissolving sugar-free electrolyte tablets starting in march 2007. the new flavour, called kona cola, is the company's fourth, and in addition to essential electrolytes, contains 40 milligrams of caffeine in each tablet. "variety is the spice of life, they say," said nuun founder tim moxey. "there are times when you want something different from fruit flavours, especially during a long ride or training session. plus the new kona cola flavour has a moderate amount of caffeine that athletes sometimes want. testers at the interbike trade show gave kona cola the thumbs up, so we ran final tests at the hawaii ironman in kona. it was a huge hit and athletes pushed us to make it available as soon as possible." nuun makes optimal hydration simple and reliable for people on the go, wherever they can find water: a single tablet, when dropped in 16 ounces of water, fizzes and is ready to drink in less than two minutes, and requires no measuring, stirring or shaking. kona cola, like all nuun flavours, is packaged in a compact and portable tube containing 12 tablets that in total, creates 1.5 gallons of light and refreshing hydration drink. nuun is made with all natural flavours and colors and has absolutely no sugar, which allows nuun drinkers to choose what they want to eat for energy and lets them hydrate without taking in unwanted calories. nuuns zero-sugar formula won't fuel the growth of bacteria in hydration bladders and bottles. 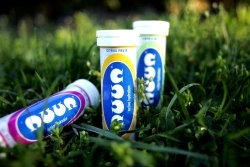 a tube of nuun retails for $6.50 at over 400 retailers in the united states and canada. nuun's four flavourstri-berry, lemon + lime, citrus fruit, and kona cola, starting in 2007are also available in 3-tube and 9-tube packs. nuun is produced in the united states. for more information, visit www.nuun.com. since 2004, nuun has been redefining hydration with the invention of its simple-to-use electrolyte tablets. conceived by a cyclist who was frustrated with overly sweet, bulky and messy sugar-laden products, nuun has changed the way runners, cyclists, hikers, skiers, climbers, backpackers, triathletesor anyone that's activemanage their hydration while on the go.